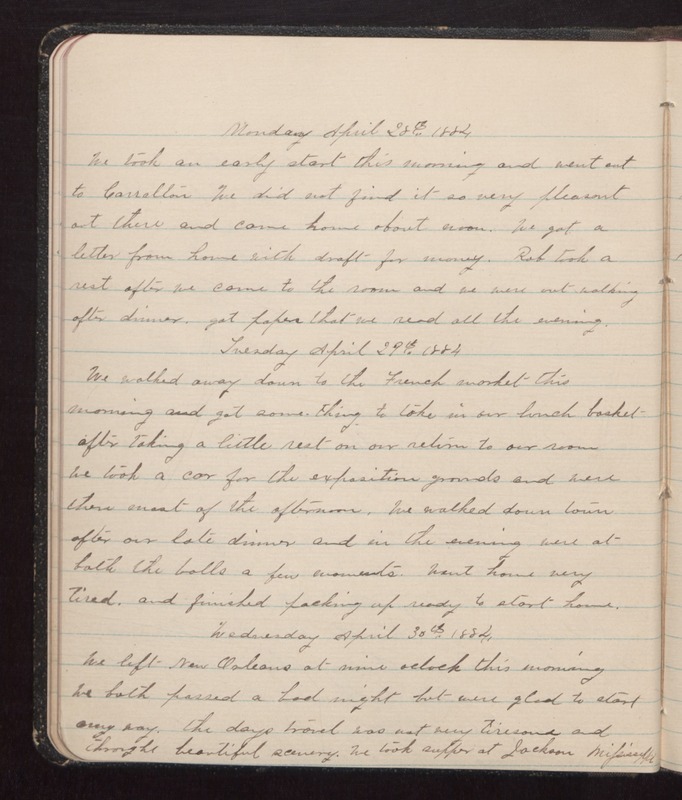 Monday April 28th 1884 We took an early start this morning and went out to Carrelton We did not find it so very pleasant out there and came home about noon. We got a letter from home with draft for money. Rob took a rest after we came to the room and we were out walking after dinner, got paper that we read all the evening. Tuesday April 29th 1884 We walked away down to the French market this morning and got some-thing to take in our lunch basket after taking a little rest on our return to our room We took a car for the exposition grounds and were there most of the afternoon. We walked down town after our late dinner and in the evening were at both the balls a few moments. Went home very tired, and finished packing up ready to start home. Wednesday April 30th 1884. We left New Orleans at nine oclock this morning We both passed a bad night but were glad to start any way, the days travel was not very tiresome and through beautiful scenery. We took supper at Jackson Mifsissippi.